Many of the poems in Toasting Marshmallows came from ideas in my writer's notebooks. Those scrawled entries— scraps of experiences, fleeting memories — were invaluable. It may be many years (or never!) before we use something in our notebooks. However, writers who take a minute to jot down an idea, an impression, or a bit of language will have a treasure trove of memory joggers to help recall events, observations, and experiences. It also helps to be a packrat. I save interesting items — special photos, a green rock, or a tree branch that looks like a snake. My notes and memorabilia help me recapture the essence of a time and to recall those all-important details. When I speak to students, I show them one of my messy, battered notebooks where I jot down ideas and observations. Sometimes I'll read an entry, such as "owl / pleat / cape" and explain how—over time and with many revisions—this rough start became the poem, "Owl at Night." Encourage your students to keep their own writing notebooks. Children often think and write more creatively when they don't feel pressured to produce a finished poem, story, or essay every time they put pencil to paper. A notebook is a safe place to practice writing. Using a notebook encourages students to think about writing as a process. I also explain to students that one of the reasons my notebook is a wreck is because I take it everywhere, even on hikes. Planning a field trip for your class? Encourage your students to bring and use their notebooks. Or, take your students outside on an observation walk with their notebooks in hand. They can jot down the unusual and surprising things they see, hear, touch, smell, or feel. Does that tree's bark look like a face? Who lives in that hole? Is the wind issuing an invitation? Encouraging the use of a writer's notebook is also one way we can help students slow down and take time to reflect before they rush off to a new experience or activity. Search for that perfect word. I enjoy using a variety of different forms — from structured to free verse; I experiment with different forms until I find the "right fit" for the poem. Flipping through a stack of revisions for one of my poems, you'd find the poem written in many different forms. However, the cinquain is almost always one of the forms I'll play with because I find that the tight structure helps me better define and refine my ideas. Cinquains can be a single poem of five lines or contain several stanzas. Students enjoy this form because cinquains provide a definite structure but do not lock them into rhyming. (When students try to rhyme, they often lose their original idea.) Cinquains also force a writer to be succinct: Every word counts! This is one of four haiku on the topic of flashlights in Toasting Marshmallows. When I was writing these haiku, I was surprised by how many associations and memories an ordinary flashlight evoked! Bring in some flashlights and turn out the lights in the classroom. 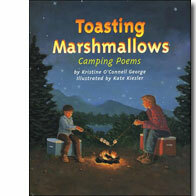 Read the flashlight haiku in Toasting Marshmallows. Pass around the flashlights and invite your students to brainstorm and write poems on flashlights. What if you were a flashlight? What might you say to a flashlight? Does a flashlight want to tell you something? Show you something? What does the flashlight beam remind you of? Have you ever been really glad you had a flashlight handy?